I’ve said it before and I’ll say it again. There is no more flawless food on the earth than a light fried, soft cloud dough cloaked with luscious, sugary frosting. Or filled with jammy berry delights. Or rolled in crunchy sugar. Or finished in a crackly coating of thin glaze. Or enameled with sprinkles. I absolutely love donuts and donuts make me happy. I defy you to nosh on a donut and not smile at the same time. In fact I believe the only thing that could make me happier than a donut is a donut on a vacation, in a location that I love. I was recently fortunate enough to take a long weekend to London, a city I have visited many times and am always humbled by. The sheer amount of history, culture, museums, cuisine and art located within a few square miles is staggering. I love that in a short walk I can go from the remains of a 2,000 year old Roman wall, to a 1000 year old fortress, next to a 7th century church then walk past a monument to a 400 year old fire and cross the Thames to my favorite Victorian Market. The city teems with a vibrant energy tempered by the weight of its own history. It truly is one of my favorite places on earth and I never tire of visiting. With food a primary distraction (ummm focus?!) in all my travels, I ventured way into my comfort zone to eat as many donuts as possible in three days. First up, Bread Ahead Bakery. Drawn in by their gorgeous Instagram and stellar reviews, I headed to one of the best places ever, the Borough Market, for my first taste of donut heaven. The donuts, beautifully arranged like proper donut soliders in formation, featured a variety of flavors. Praline, raspberry jam, velvet chocolate, honeycomb and vanilla all beckoned me from behind the glass case. The fat dollops of filling spilled out of the puffy spheres. We chose a raspberry and a praline. The yeast dough was fluffy with a slight bite and the donuts were jammed...with delicious, sweet jam. The caster sugar coating added a crunchy texture which paired wonderfully with the soft dough. I see why Bread Ahead is consistently rated as a top London bakery and even recent visits from the royal family - it is truly a donut fit for a future King! Lamenting that I couldn’t take one of the many classes Bread Ahead offers, I was thrilled to find a recipe for their famous donuts online - I can’t wait to give it a try! A short walk from the Borough Market, past the glossy modern London Bridge station and under a graffitied train viaduct, is a part of London rarely visited by tourists. The Borough, Camden and Portobello Road markets get all the glory but I’m here to tell you to make a visit to the Saturday only, Maltby Street Market. I’ll be doing a separate post on the sheer amazingness of this market but it is well worth your time. Additionally, a Saturday visit to the area is the only day the St. John Bakery makes their legendary donuts. Located in a nondescript, obscure train arch - I honestly thought at first we were in the wrong location - is a bakery selling warm, delightful donuts and other sweet and savory treats to consume as you wander the market and visit the local breweries. The flavors change with the seasons and the jam is homemade. During our visit, they offered blueberry and raspberry jam, along with vanilla custard and chocolate. My husband is obsessed with anything blueberry so we had to choose it. Wow. The donuts were slightly warm and the jam was not overly sweet. The jam spilled out when we broke it in half, filled to the brim with blueberry goodness. If walking around with slightly sticky hands is the price I have to pay for these donuts, so be it. The crunchy sugar provided a nice contrast. Classic donuts prepared by a Michelin starred chef. A perfect start to a Saturday. And again, I was fortunate enough to find a recipe! Our penultimate stop for donuts was back on the north side of the Thames at Crosstown Donuts in Piccadilly. There are many locations around town - I recommend making sure you go to a bakery and not just a location that sells their donuts. If you are looking for American style donuts in London, these are the closest option. A smorgasbord of donuts awaited us - gingerbread, chocolate truffle, vanilla glazed rings, sugar rings and raspberry jam filled. Crosstown has both cake and yeast (sourdough) donuts. After snacking on yeast donuts at our previous locations, we opted for cake donuts at Crosstown. I like ginger but I don’t love ginger, I find it a spice that can be overwhelming very quickly, but I do love a well seasoned gingerbread. The candied ginger crumbs and oranges on top gave a fantastic contrast to the very moist donut below. The depth of flavor was fantastic and balanced - chocolatey with a warm gingerbread spice. It was a wonderful winter holiday-centric donut. The chocolate truffle yeast donut was rich and well balanced and not overly doughy, as I find many yeast donuts are. The ratio of icing to dough is crucial and hard to get right. Another note...if you want to make sure a location doesn’t run out of the donut you want, you can order ahead! Our final stop in our donut adventures took us to Dum Dum Donutterie in Shoreditch Boxpark, which we had been introduced to on a previous London East End Food Tour (I highly recommend this free tour!). At that time I had expressed to our guide that I was eager for fried dough and he gave me an funny stare. 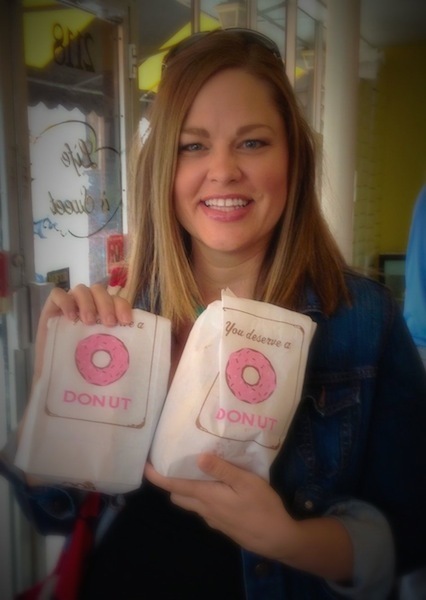 When we arrived at Dum Dum I realized why...Dum Dum bakes all of their donuts! Dum Dum specializes in a variety of croissant style donuts, called cro’s, the most popular, and in my opinion, the most tasty, is the black and white zebra cro. With gorgeous alternating layers of chocolate and plain croissant dough, filled with light chocolate buttercream and topped with a mix of chocolate and white chocolate swirls, it is sublimely light, airy and decadent. Their Nutella croissant donut was also tasty, stuffed with nutella buttercream, topped with chocolate ganache and crunchy hazelnuts and coated in crunchy sugar. The yeast donuts were also superb and were almost totally coated in a variety of shiny, crackly sweet glazes. The Shoreditch Boxpark ambience is also so charming...small storefronts, which are actually shipping containers, selling a variety of locally made products! It all felt too hip and cool for me, but I had donuts so what did I care? London is always a good idea. A donut is always a good idea. Therefore a donut in London is probably the best idea. With all of the incredible food options in this stunning city, the humble donut has been elevated to new scrumptious heights. 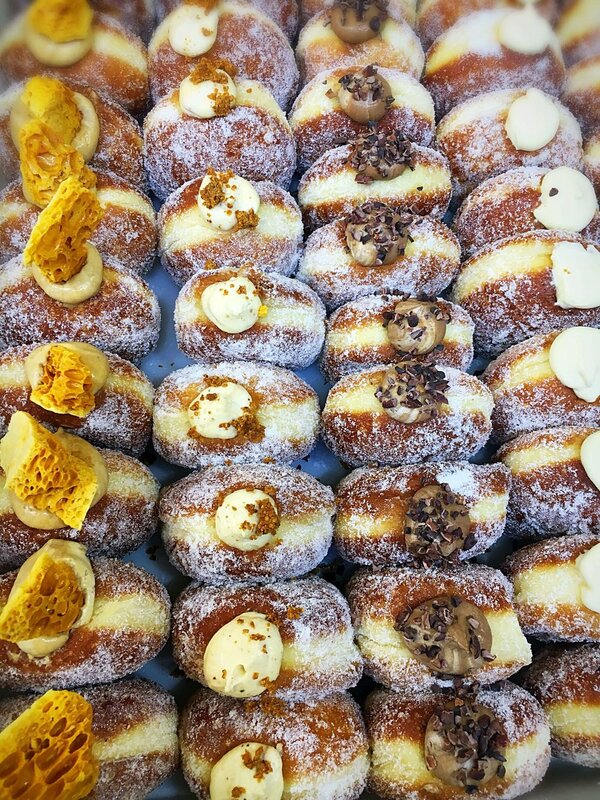 All of these London donuts are dangerously *moreish!